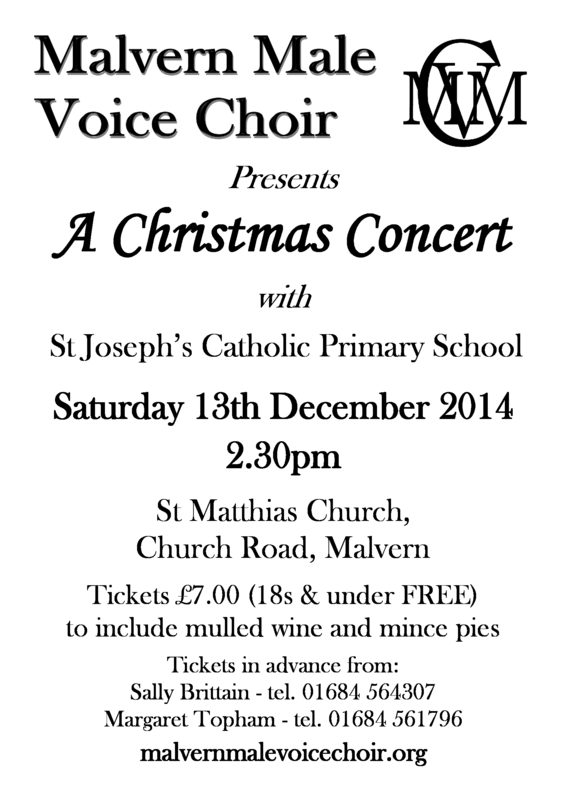 Malvern Male Voice Choir are performing their Christmas Concert on the 13th December at 2.30 pm with St Joseph’s Catholic Primary School at St Matthias Church, Malvern Link. The Christmas Concert at St Matthias Church will be the culmination of a very varied and busy singing year for the Choir. Charles Pavey, the Choir’s Musical Director, said “It’s great to be back at St Matthias again just before Christmas and we are pleased to have with us for the first time St Joseph’s Catholic Primary School Choir. These joint concerts with local schools are always a huge success and enjoyed by everyone, audience and participants alike”. A varied programme of seasonal songs and carols is guaranteed and this joyful Christmas celebration includes an opportunity for audience participation and seasonal food and drink to finish. The Christmas Concert at St Matthias, Church Road, Malvern Link, starts at 2.30pm. Tickets, which cost £7 (18’s and Under Free) and include mulled wine and mince pies, can be purchased in advance from Sally Brittain on 01684 564307 or Margaret Topham on 01684 561796. Any remaining can be purchased on the door.